Although still an important genus in its own right, Heptagenia no longer includes many of the key hatches it used to. Several important species have been moved to its sister genera Nixe, Leucrocuta, and Ecdyonurus. Of the remaining species, the best hatches come from Heptagenia elegantula in the West. The genus is generally unimportant in the East and Midwest, where the most likely species to produce fishable hatches is Heptagenia pulla. 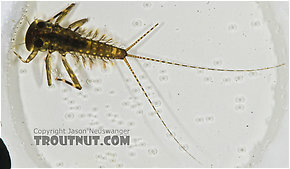 Heptagenia nymphs emerge very quickly, so emerger patterns are unimportant. The duns may or may not float long enough to get trout excited. Spinner falls give the most promising action produced by Heptagenia species. Heptagenia pulla (Golden Dun) Mayfly Nymph View 8 PicturesLike most Alaskan mayflies, this one is tricky to identify to the species level. See the discussion section for an informative chat about this one's ID. The current leaning is to call it a fairly immature Heptagenia pulla nymph, but a case has been made for Heptagenia elegantula as well. I went to the entomology library today and photocopied the 1985 paper that first described this curious species. I've updated the culacantha page with this information. Many thanks to user Softhackle for digging up this link. I knew about the thread from back when it started, but I wasn't able to find it when I went back to look last night. Good work! 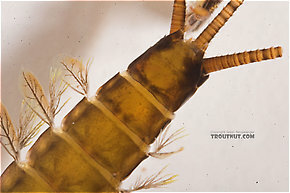 Fly Fisherman Magazine forum topic with two pictures of a H. culacantha dun. I've added the species to the "live" part of the database and put up a rudimentary page where I can compile any more information we find. This is a shot in the dark, but I'm trying to track down descriptive information about a rather rare "mystery mayfly." Heptagenia culacantha was identified in 1985 (Evans, Botts, & Flowers). About all I have right now is a tease from the Journal of the New York Entomological Society--"This infrequently taken species, one of the largest and most striking North American heptageniids, is known only from Pennsylvania and New York." 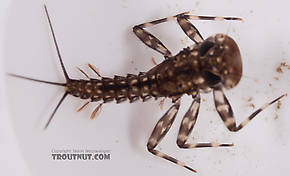 The reason I'm so interested is that I believe I encounter a fishable hatch of these mayflies every season on one of my favorite PA brook trout headwaters. If that conjures a picture of fishing to 6-7" dinks, you'll need to double those numbers to appreciate how special this stream really is. Add to that an image of the fish rising to these beautiful "mystery mayflies" that hatch in the evening, following a day-long emergence of Dark Green Drakes (Litobrancha recurvata)! It is such a special event that it is one of the very few things that can pull me away from fishing my favorite Olive Morning Dun hatch (Drunella lata, nee cornuta). Help! There are 5 more topics.